THERE is just something about traditional steel-framed bikes. Whether they evoke youthful memories of watching some of the greats battling their way up an gravel alpine climb or you just love a nice set of lugs, they have managed to survive the rise and fall of aluminium and I dare say they will be round long after carbon. Yes, the sculpted, wind-tunnel-hones lines of pro peloton carbon bikes are nice to look and definitely serve a purpose being oh-so light and blah-blah – I have two, if you’re asking – but there is just something timeless about steel bikes. It’s almost like they have a soul. After all, the basic diamond shape of a bicycle frame has not changed significantly for more than 100 years – even if the material used in their manufacture have progressed considerably. Steel itself is a material whose own development over the last century has been interwoven with that of the bicycle. Most production steel bikes tend to be TIG welded together or Tungsten Inert Gas, for the chemistry buffs out there. Tubes are cut and mitred, so that they fit against one another and then a weld is made to join the different tubes. Whereas higher end and custom-made frames commonly use lugs – oooh, lovely lugs [sorry – ed] – in the joining of the tubes. Lugs are joining pieces that fit around the ends of the tubes, which allow two or more tubes to be joined together. The lugs are then brazed onto the tubes in order to fix them into place. Brazing involves the use of another metal – such as brass or silver – that is melted to form the join and then cooled to secure it. There are arguments for – such as the fact that by brazing materials onto the frame at lower temperatures, you avoid the risk of crystallising the metal – but, more importantly for steel bike aficionados, they look stylist and come in all different shapes, sizes and patterns. 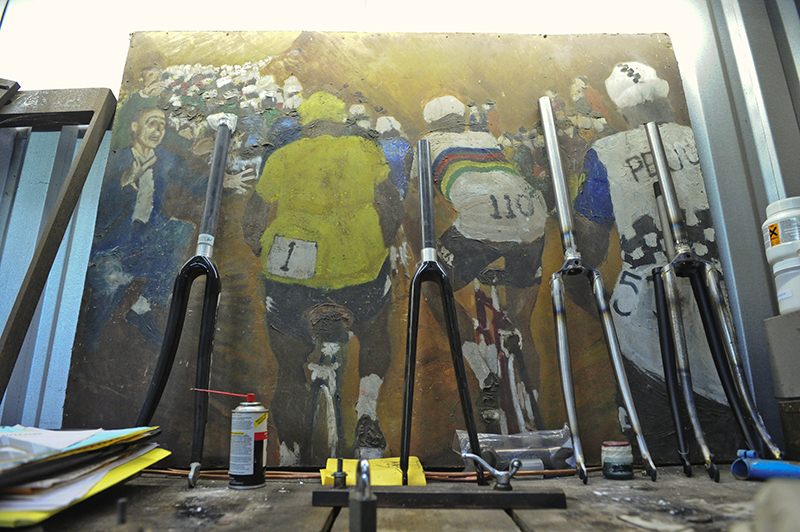 Most frame-builders will use one of two types of steel – Reynolds or Columbus. Reynolds is based in the UK and started life in 1841 as makers of nails before turning to bicycle tubing at the end of the 19th century. The firm patented the invention of butted tubes in 1898 and have been a firm choice for many traditional frame-builders ever since. Their flagship product these days is Reynolds 953, which purports to benefit from being a “martensitic-aging stainless steel alloy” with “tensile strength in excess of 2000 Mpa”. To you or me, that means it’s light and strong. Columbus has its origins as part of an Italian firm founded in 1919 by Antonio Luigi Columbo – no relation to the American detective. In addition to making tubes for bicycle frame-builders, Columbo supplied a diverse customer base – from furniture makers to manufacturers of aircraft. 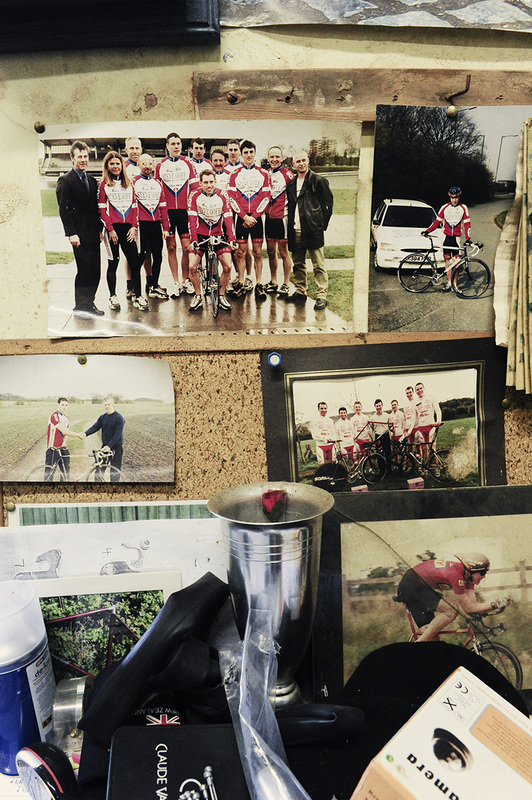 In 1977, a dedicated firm, was established to develop and manufacture specialist bike tubing. Being Italian, Columbus has contributed to the reputation for quality associated with Italian frame-builders. 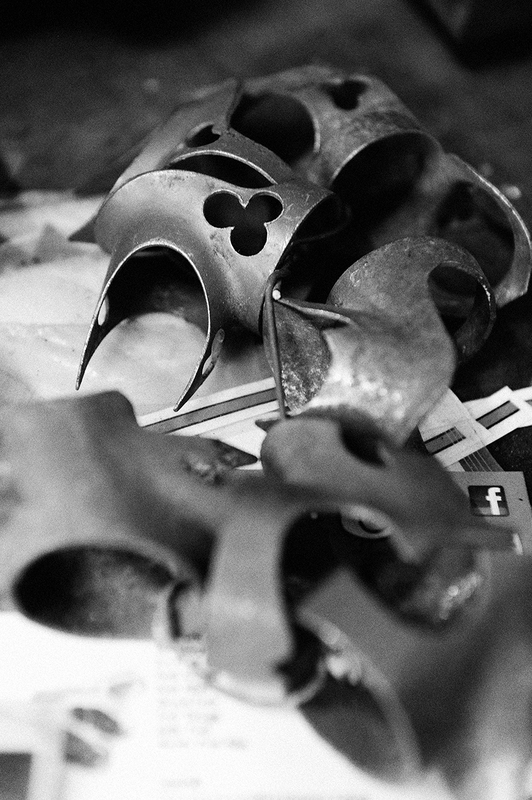 Basically, if you love all things Campagnolo, then this will probably be your choice of material for your steel bike. So why do people choose steel? Well, the main argument in favour of a steel-framed bike, particularly over a carbon fibre frame, is strength and durability. Steel is resilient to the repeated stresses placed on the bike frame when riding. Not only that, but it is also tough, as well as being resistant to cracks and impact. When dents or nicks do occur, with steel, they are less likely to turn into full-blown failures. If there is a failure, it tends to progress slowly rather than catastrophically – unlike carbon fibre. People also like to know there was a human directly involved in its manufacture. They like to feel there is expertise, craftsmanship and care deeply imbued within its fabrication. 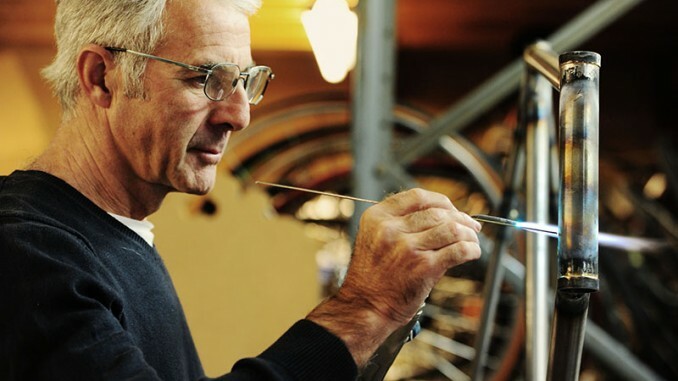 In buying a higher-quality, or custom-made, steel frame bike, a cyclist is supporting and celebrating the craft of bicycle-making and doing their own little bit to ensure that it continues into the future. With that in mind, we heading over to Pimbo in Skelmersdale, near West Lancashire, to pick the brain of traditional steel-bike builder, Steve Goff. According to Steve, demand is picking up. On the morning we dropped by, he was busy working his way through one of 100 orders. Steve has more than 25 years of building steel frames, but his interest in fabricating bikes started when he was just 15 and used to build up his own bikes from old frames that he found knocking about the streets of Liverpool. Together with a friend from school, Steve would mesh together scrap parts and build them up into racing bikes before respraying them to look like those belonging to pros of that era. Steve said: “I got a job in Walton Vale Cycles when I left school. It was advertised in the Liverpool Echo, so I told my mum ‘cut my hair, I am going for a job interview’. I rode my bike out to Walton Vale, saw the guy in charge, Alan Hart, and I got the job. 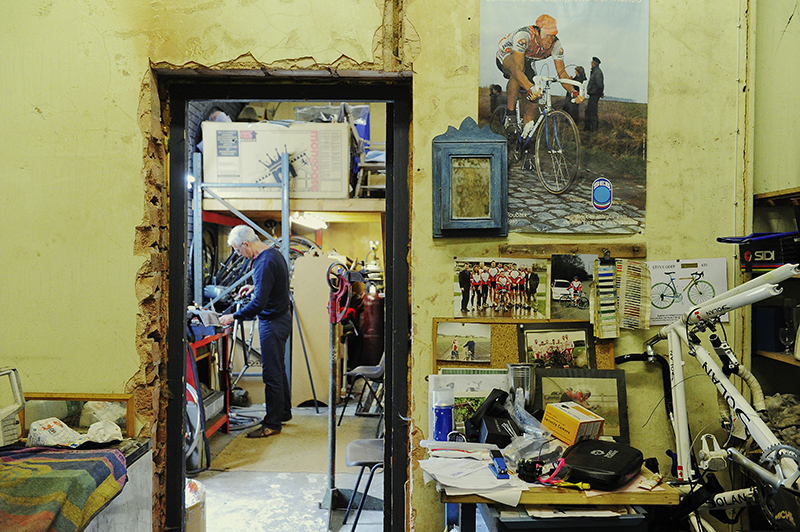 “I worked there as a sort of sales assistant, but luckily Norman Roberts was the frame builder there. At that point, I was getting interested in racing and, at 16, I did quite a few 10s and criteriums at junior schoolboy level, so I was getting interested in the frame building and what Norman was doing. Like all promising riders during those days, Steve headed over to Belgium and France with little more than his bike, and a dream of making it professional. Year-after-year, he headed back every season to hone his craft. 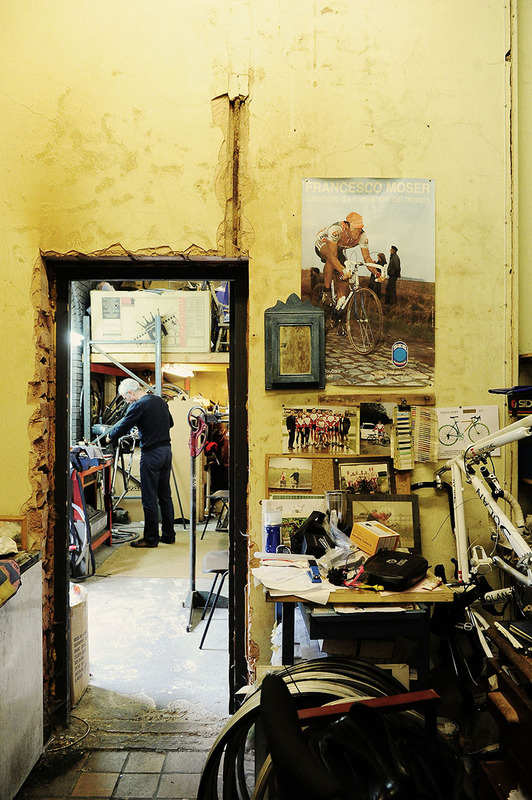 In between, he got a job working at Pete Matthews’ shop and learnt the art of wheel-building. JM: How has steel frame building changed over the years since you first started? SG: Obviously, when I first started, everybody had a hand-built steel frame. 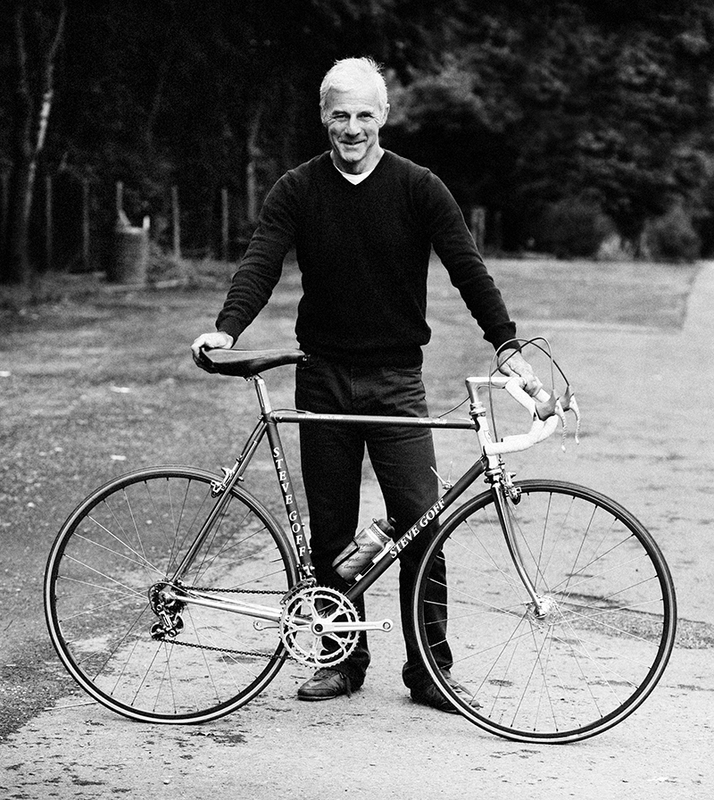 All the club cyclists would have a steel frame from the likes of Harry Quinn or one of the Manchester shops. Then that started dying out when aluminium came in and they were off the peg. People got used to going in and picking them off the rack – that’s when the made-to-measure sizes started dying out. I struggled when that happened. My frames went right down, but they’re starting to pick up again now. People are turning back to steel. Obviously, racing lads will have a carbon frame because that’s the lightest, but they are so fragile that guys and girls like having a nice solid bike as well. Also, there is a lot of interest in retro frames. I do a lot of renovations of classic frames and I get a lot of the same frames back to be renovated that I built 25 years ago. There is a lot of interest in that and building steel forks. At one stage it was a steel fork with carbon frames, but I don’t supply carbon forks any more – it’s all steel forks and steel frame. I think that people now want the quality and that’s what they get here. JM: Why do you think that people are turning back to both steel frames and steel forks again? SG: People appreciate the craftsmanship. You know, you can actually get something that is made in this country. You can get a personal service and actually meet the guy who is going to build it for you. You can get what you want, like a made-to-measure suit, but one that you can ride on and go round on. You can choose your colours and it’s more of a personal thing. I get a lot of middle-aged guys coming and saying ‘this is the last bike that I am ever going to have and I want it to last’, so that’s where we come in. They come here and they get a good quality bike. JM: Just talk me through the process of how you actually put a frame together from start to finish? What happens from the moment someone gets in touch and says to you ‘I want a steel bike’? SG: They’ll call up, as I don’t really do emails and it’s more of a personal service. We will then have a bit of a chat, find out what type of riding they’re wanting to do and what sort of bike that they want. From there, they’ll make an appointment, get measured up. They can bring their own bike and I can watch them riding round for a bit, but I do have a cycle jig, which I can move round to all the different dimensions. More importantly, I’ll chat to them to see if they have any problems. Most people have back or neck problems, so they might want to sit a bit higher or they want a touring position or even an out-and-out racing position. We get the general idea of improving their riding position for the bike. From there I choose the tubing. That’s got to be suitable for the type of riding that they’re going to do and also their strength and body weight comes into it. If they’re a big, powerful lad, then you’re looking at an extra strong frame. JM And a wide range of sizes? SG That’s another aspect of it. I do make very small ones and I make very large ones – which you obviously can’t get from a shop right off the peg. Once they’ve decided what they want like colours, then we decided on a completion date. Maybe they want it for a special trip, a sportive or a race. Some people like ordering a new bike for the start of the season. That’s always nice. From there, we actually go on to building it. 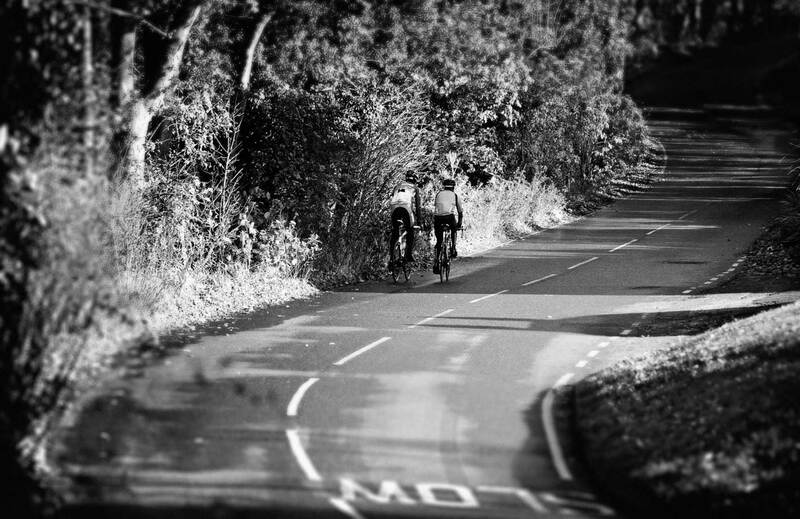 For the tubing, we either use Reynolds or Columbus – those are the most popular and the most top quality ones, really. Then it’s to the building board, where I cut out the frame and mitre it up perfectly. If it has lugs, then the lugs fit over the mitres, then that’s tacked and put in the cycle frame jig. That comes out and it’s fully brazed and cleaned up. Then I’ll build the fork, which will depend on what size brake, mudguard, etc. Then we would put the stays in and balance up the frame with the wheels in, so if it’s a horizontal tube then it will be a horizontal top tube. Then we would clean up the frame and put like the bottom bosses on, all the gear mountings and brake mountings ready to go off to the sprayers, which is stove enamel done by C&G in Liverpool. The frame then comes back all sparkling and new and the customers are highly delighted with the product. JM: What advantages does traditional steel have over modern day carbon? SG: Steel cannot compete over weight with carbon frames. Lads and girls who are racing will use carbon because it’s the lightest and latest frames out there – that’s usually what people will race on. However, people who want to do sportives and other riding , you can come here, be measured up and have frame that fits you exactly and that you’re comfortable on. You don’t have to fit yourself into a small, medium or large frame, you can get something that is built for you to the millimetre. You don’t have to stretch yourself out or be bounced round by carbon, you are going to get a really comfortable bike that is a more traditional way of cycling. 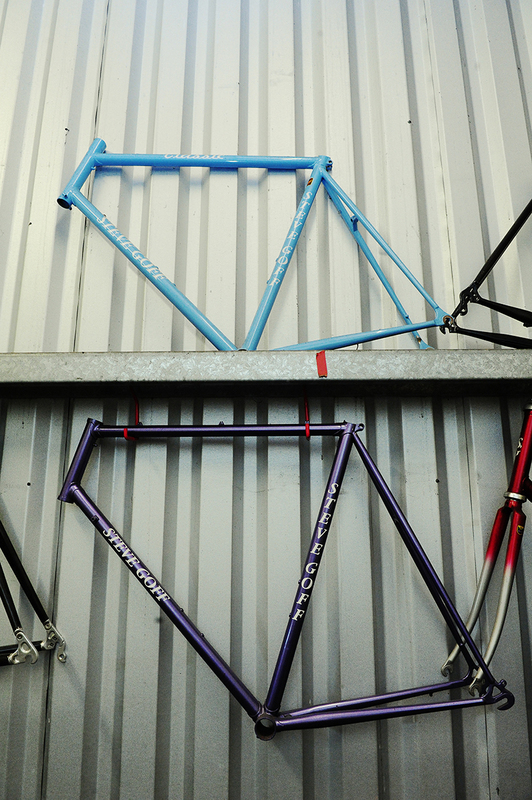 Steve’s frames start from £415 with fork. I knew Steve when he was called the Black Knight. Pleased to see he’s done well for himself and kept alive a dying craft!